As a break during the Class 43 IC125 remake, I’ve been asked by Lorenzo to design some buffers, as an easy 3D exercise, which I was glad to do. Within one afternoon I came up with the design of the Metropolitan Electric Locomotive BT-H 1907 buffer in 1:87 HO scale. 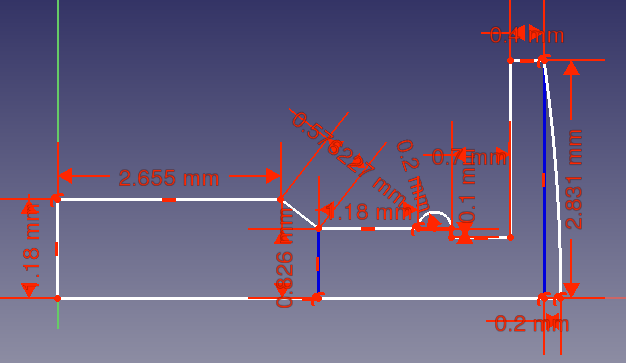 First I drew the section of the buffer, as a FreeCAD sketch, using lines and circles. I generated the revolution solid from the section to create the body of the buffer, to which I added the plate with the bolts to attach it to the carriage. The front part still needs to be cut on top and bottom, to reach the final shape: it’s enough to intersect the complete structure with a cuboid, as long as the buffer section and with the height exactly dimensioned to cut the round part of the buffer, wide enough to include all the buffer body. Once the buffer is complete, it’s time to create an array of as many as wished (in my case 10). In order to have all them printed there must be a sprue added to the matrix of buffers: then let’s add a support to the single element before creating the bidimensional array. I already uploaded this model in 1:87 scale on shapeways and am waiting for the prototype in Frosted Extreme Detail. After checking it, I will make it available for sale, also in other scales and materials.